Cash ‘N Guns is a gangster-themed card game for 4-8 players. The players are a team of criminals who just pulled off a successful heist, and are now at the safehouse choosing how to divide their spoils. Every player is given a foam pistol and a certain number of bullet cards, some real and some blanks. Every round the players select a (hidden) bullet to use, and then on a cue everyone points their gun at a target of their choice. Players then have to choose if they want to gamble that everyone aiming for them is using a blank, or drop their gun and forfeit their share of the loot. After the non-cowards reveal their bullets, any players who are shot with a live round lose one of their 3 health points and also miss out on the loot. Remaining players take turns grabbing a piece of that round’s loot cards, which includes the Desk which makes that player the Godfather for the next round. There are five types of loot: cash is straight victory points, diamonds are worth less than cash but whoever has the most diamonds at the end of the game earns a very valuable Big Diamond, Paintings get more valuable the more of them a player owns, and medkits and bullets have no cash value but aid you during gameplay. The Godfather player always sets the pace of the round; everyone aims, surrenders, or fires on her mark, she gets first choice of loot, and during the aiming phase she can force one player of her choice to select a new target. After eight rounds, any players who didn’t lose all of their life points count up their winnings and whoever has the most wins. A large part of the strategy is remembering what types of bullets each player has already fired, and also looking at the currently-available loot cards and deciding whether they’re worth the risk of being shot to get your hands on a portion. Artwise, the game has a cartoony look and a non-serious vibe, which I think is a smart design choice because of the use of realish-looking pistols. It keeps the rampant backstabbing from feeling personal and emphasizes the fun over the violent undertones. The strategy in Cash ‘N Guns is relatively light but the rules are so simple, and the mechanics set the stage so well, that the gameplay keeps everyone on their toes. Since the player’s decisions control almost everything that happens, and randomness is completely absent beyond which loot cards are drawn at the beginning of the round, I’ve found the game to have a lot of replayability and the outcome remains uncertain even in the late stages of the game. Not to mention I haven’t yet found a single gaming group that didn’t enjoy getting to point the foam pistols at each other. Cash ‘N Guns has become my default party game I bring to any engagement, as it’s always sure to be a huge success. Bloodbound is a hidden-identity game for 6 to 12 players. The premise is that two ancient cults of immortal vampires have assembled for a final fateful meeting, with both sides hoping to murder the other’s clan leader. Each player is secretly assigned a character card, each numbered anywhere from 1 to 9. These numbers tell you both your rank in the hierarchy (lower-numbered vampires are ranked higher, and whoever’s closest to 1 on each team is the clan leader) and your special power (each number is a specific character with a constant battlefield ability.) Since there are 18 possible characters and a max of 12 players, you’ll never use all ranks in a given game so nobody knows for sure who the clan leaders are (only their personal probability of being the highest-ranked vampire on their team). Half of the players are on the Blue clan, and half are on the Red clan. Each player is also given a notched card cover that hides all info except the player’s allegiance to clan Red or Blue; this is because at the beginning of the game, everybody shows their covered card to the player on their left. The starting player is given a cardboard knife (the game rules don’t suggest how to choose this starting player, we use ‘spin the knife’ as it feels appropriate) which they must then choose to stab someone else at the table with (thereby passing the knife to that player and making it their turn). There’s a large pool of tokens in the center of the board, and whenever a player is stabbed they must draw a token matching either their personal numerical rank or their team color (though certain ranks have the privilege of drawing neutral ‘white’ tokens that let them hide their allegiances until they get stabbed more). In this way, the whole playerbase slowly learns information about each other, and must use this info to sleuth out and kill the enemy clan leader before their own perishes. If one player gets stabbed three times, they die and the game ends. If the killed player is their clan’s leader, the other team wins; if they’re anyone else, the stabbing team loses. Every numbered rank has a special ability that activates when the player chooses to reveal their role from getting stabbed. For example, the courtesan (#9) can give her target a fan which prevents the victim’s allies from intercepting future attacks. As you can probably tell, it’s a lot harder to explain Bloodbound in a nutshell than Cash ‘N Guns, and this difficulty extends to any new players at the table. The story, gameplay, and character mechanics can seem unclear from the getgo, but things clear up quickly once the game has actually begun and the knife is being passed around. Luckily the games go super quickly due to how fast everyone racks up knife wounds, and I’ve never met a gaming group that didn’t play a couple rounds in a row, meaning any confusion is soon cleared up in time to play future games the right way. My favorite part of Bloodbound is that it’s a hidden-identity game where both teams are on equal footing. Most games in this genre springboarded from Mafia, and thus involve a minority of active saboteurs hiding amongst a majority of passive civilians. Bloodbound, on the other hand, involves little ‘social manipulation’ and the detective work is instead focused on logically examining why the active player chose to stab who she did. In fact, both teams are on such even footing that if there are an odd number of players, one player becomes the lone wolf Inquisitor! The Inquisitor’s goal is to deduce which clan is going to win before it happens. Once he reveals his identity (by drawing his rank token after being stabbed like anyone else), he passes out face-down cursed tomes to any players of his choice, only one of which is the True Curse. At the end of the game, the Inquisitor wins if he had True Cursed the victorious clan leader. The Inquisitor is something of an awkward role; though he doesn’t feel over or under-powered, in practice it can be odd playing with him since he tends to ally with the first clan to gain an advantage, leading to a snowball effect where the winning clan can capitalize on his early-game actions after eliminating him and the underdog team has an even harder time through no real fault of their own. Since the core game is so delicately balanced, I personally prefer not playing with the Inquisitor. That being said, I can’t think of a better solution for odd playercounts since the game’s design mandates that both clans have even teams. 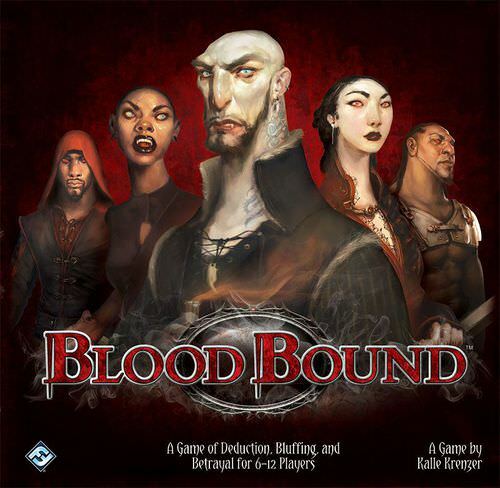 Bloodbound used to be hard to find, but was re-released in 2014 though the second edition had no gameplay changes and merely swapped out the photorealistic character portraits for stylized gothic art that I’m honestly not a fan of. I’m pleased my copy has the older “Twilight cosplayers” art, but I hope you prefer the latter because I haven’t seen the first edition available for purchase anywhere without drastically overpaying for a cosmetic difference. Both games have more pros than cons, of course, since I think they’re awesome and highly recommend both of them. They don’t share much in common beyond assaulting each other with fake weaponry, but that’s usually more than enough to get my friends to agree to give it a try!